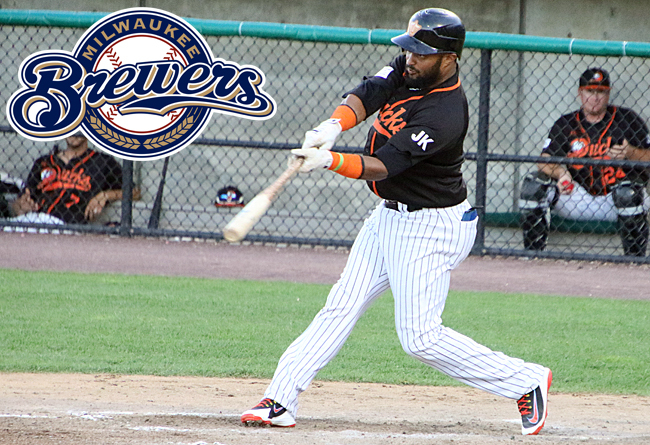 (Central Islip, N.Y., Aug. 31, 2018) – The Long Island Ducks today announced the contract of outfielder Emilio Bonifacio was purchased by the Milwaukee Brewers organization. In a separate transaction, the Ducks acquired starting pitcher Brett Marshall from the Southern Maryland Blue Crabs. Bonifacio departs as the Atlantic League’s batting leader with a .348 batting average in 70 games played this season. He totaled 95 hits with the Ducks, including three home runs, 17 doubles and two triples, and he accrued 36 RBIs, 42 runs scored and a .385 on-base percentage. The 33-year-old departs the Ducks having hit safely in each of his past 23 games played, good for the longest hitting streak in the league this year. He wreaked havoc on the base paths as well, stealing 20 bases while being caught just twice, good for a .909 stolen base percentage that ranks fourth in the league. Defensively, Bonifacio committed just four errors and spent time both in the outfield and at shortstop. The Dominican Republic native has 11 seasons of Major League experience, playing with the Arizona Diamondbacks (2007-08), Washington Nationals (2008), Florida/Miami Marlins (2009-12), Toronto Blue Jays (2013), Kansas City Royals (2013), Chicago Cubs (2014), Atlanta Braves (2014, 2016-17) and Chicago White Sox (2015). In 831 career MLB games, he has compiled a .256 batting average, 13 home runs, 165 RBI, 355 runs, 669 hits, 95 doubles, 33 triples and 166 stolen bases. Additionally, he played every defensive position except for catcher and first base, accruing a .970 fielding percentage in “The Show”. Bonifacio becomes the sixth Duck to join a Major League organization in 2018 and the third whose contract was purchased during the 2018 regular season (catcher Wilkin Castillo, Yankees; left-handed pitcher Daniel Schlereth, Mariners). Three members of the 2017 Ducks, including infielder Giovanny Alfonzo (New York Mets), catcher Alex Burg (Los Angeles Dodgers) and catcher Jordan Pacheco (Minnesota Twins) were all signed prior to the season. Additionally, left-handed pitcher Bennett Parry’s contract was purchased by the Chinatrust Brothers of the Chinese Professional Baseball League this August. Marshall was acquired from the Southern Maryland Blue Crabs to complete an earlier trade (Jason Creasy, May 6, 2018). The former Major Leaguer is currently in his fourth Atlantic League season, spending the first three with the Sugar Land Skeeters and splitting this year with Sugar Land and Southern Maryland. In 22 starts this season, he has compiled a 5-8 record with a 4.59 ERA and 96 strikeouts, including a 4.25 ERA over his 13 starts with the Blue Crabs. Overall, the 28-year-old has a 22-22 record with a 4.14 ERA and 266 strikeouts in 69 ALPB appearances (66 starts). The Texas native spent time in the Major Leagues with the New York Yankees in 2013. He made three MLB appearances that year, yielding six runs over 12 innings of work while striking out seven batters. The righty spent the first six seasons of his career in the Yankees organization before going on to play in the Cincinnati Reds, Colorado Rockies and Tampa Bay Rays systems. He was selected as an MiLB.com Organization All-Star as well as an Eastern League Mid-Season All-Star in 2012 when he went 13-7 with a 3.52 ERA in 27 starts. Marshall was originally drafted by the Yankees in the sixth round of the 2008 amateur draft.